The last two posts showed the backlit profile of the Superstition Mountains east of Phoenix, but now you’re seeing a different sort of profile with the sun beyond it. Move forward from September 29th outside Phoenix to October 17th inside Austin, when I pulled a Steve Gingold by being out and ready for pictures so early in the morning that it was still dark. Where, I’d asked myself, might I have a good view toward the east to photograph the sunrise, and I decided to check out the site of the former Mueller Airport, which has been undergoing redevelopment for a decade. Now that you know the setting, you can understand that in the background of this photograph you’re seeing not a range of mountains but a pile of dirt at a construction site (though your imagination can still make a mountain out of what would have been a very large mole hill). 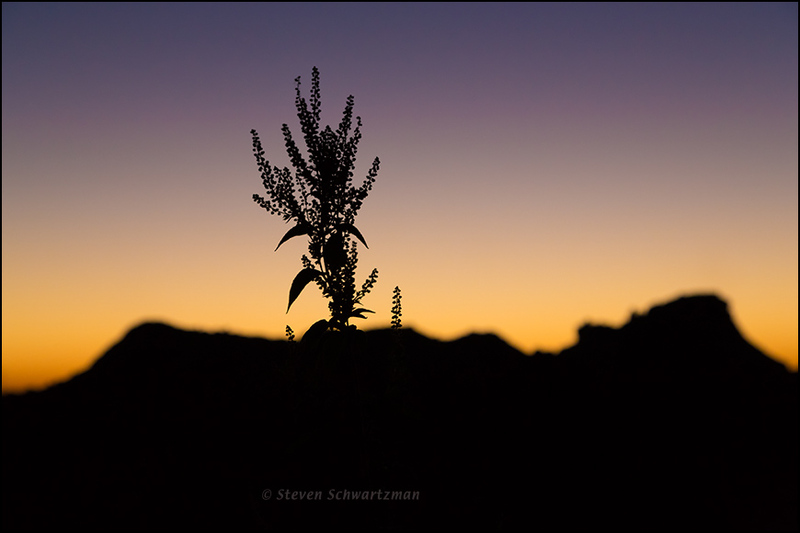 As darkness gave way to dawn, the brightening eastern sky silhouetted this giant ragweed plant, Ambrosia trifida, that I chose as one of my subjects. If you’d like to know what a giant ragweed plant looks like when there’s light on it, you can check out a post from three years ago.